Beware of headlines which suggest scientists are "on the brink of HIV cure", or "HIV cure close". They grab the attention - which is of course the aim of a headline - but talk of a breakthrough is premature. That may sound astonishing unless you know that conventional antiretroviral therapy (ART) - which the patient was also taking - already reduces HIV to undetectable levels. Sarah Fidler, Prof of HIV Medicine at Imperial College London, who is leading the trial, told me: "All the participants are taking antiretrovirals and so will have an undetectable viral load, which shows the great success of current treatment." It does indeed. HIV medication has turned the infection from a death sentence to a chronic, manageable condition, which is remarkable. The limitation of ART is that it cannot eliminate HIV. The virus remains dormant in some immune cells and will start replicating if patients stop taking their medication. That's why antiretrovirals must be taken for life. The RIVERS trial - which stands for Research in Viral Eradication of HIV Reservoirs - is trying to rid the virus completely from the body. So far, 39 out of a total of 50 patients have been recruited to the trial. All will receive ART but half will also be given a drug which forces the virus to emerge from hiding places in the body. These chosen patients will also receive two vaccines which aim to boost the immune system so that it can attack HIV-infected cells. The strategy is called "kick and kill". The anonymous patient quoted in the newspaper article is simply the first of the participants to have completed the kick and kill treatment. No results are expected until 2018. The trial is being conducted by a consortium of research teams at Imperial and King's College, London, Oxford and Cambridge Universities and University College London. The partnership began six years ago, and set out to search for a cure for HIV. Mark Samuels, managing director of the National Institute for Health Research Office for Clinical Research Infra­structure, which set up the medical consortium, told me: "This is an unprecedented collaboration and to get to clinical trials in six years shows remarkable progress." So how will the researchers know whether their trial has been a success? This will take some time and involve detailed analysis of blood samples from volunteers. John Frater, Prof of Infectious Disease at Oxford University, told me: "We will carry out a very targeted genetic test to look for HIV lying dormant within immune cells." All the trial volunteers are newly infected HIV patients which means they will have a small viral reservoir and their immune system will not have been repeatedly damaged by the virus. If it is possible to cure HIV, these patients represent the easiest target. But even if the trial is a complete success, caution will be required in interpreting the results because it may not work in long-standing HIV patients. Dr Michael Brady, medical director Terrence Higgins Trust told me: "In test tubes it has been shown that you can drive the virus out of dormant cells, but we will have to wait and see whether it works in patients. "Even if it works we can't talk about a cure for everyone and there would need to be bigger trials." To date, only one person appears to have been cured of HIV infection. Timothy Ray Brown, the so-called Berlin patient, received a bone marrow transplant from a donor with natural immunity to the virus. However, bone marrow transplants are potentially dangerous and so not an approach that is recommended. 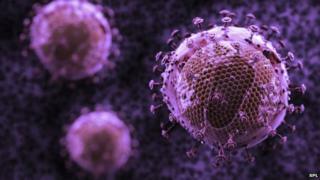 Earlier this year I reported on a gene editing trial in California involving 80 HIV patients. They had immune cells in their blood removed and editing to try to mimic the gene mutation which gives some people a natural immunity to HIV. One of the volunteers, Matt Chappell, has been off all antiretroviral medication for two years since having his immune cells gene edited. These were small trials so caution is needed before reading too much into the results, but they are nonetheless promising. The British trial is taking a different approach but with the same aim - trying to free patients from the need to take daily medication. But talk of cures is premature.